With the present work, I come to the end of my task of providing Balthasar's prolix trilogy - Herrlichkeit, Theodramatik, Theologik - with an interpretative summary. The last member of the trio, the theological logic, is also the shortest. But since it contains, in its opening volume, Balthasar's metaphysics and epistemology - a synthesis of Christian Scholasticism and the classical German philosophical tradition, theologically re-worked - it is hardly the least demanding. The effort of understanding is rewarded, however, with a fuller grasp of Balthasar's contentions in the aesthetics and dramatics, as well as in the remaining volumes of Theologik itself. Readers of my two earlier commentaries, The Word Has Been Abroad and No Bloodless Myth, will have found some material on and the drama, respectively: enough to explain the terms 'aesthetics' and 'dramatics' which control the sub-titles of these 'Guides'. 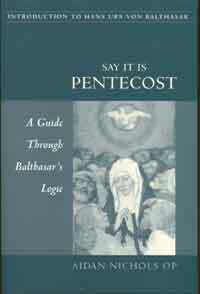 But of logic as ordinarily understood - whether the traditional syllogistic variety, or the modal logic favoured in the later Middle Ages as again today, or the symbolic logic of the mathematically inclined, they will find little if any trace in Say It Is Pentecost. As with Hegel, Balthasar's logic is his ontology, his study of being - though to be sure there are discussions here of language, in which being comes to expression. Not that the second and third volumes of Theologik - on the difference made to ontology by Christology and Pneumatology - are an afterthought in this respect. For Balthasar, as his (separate) Epilog to the trilogy, also discussed here, points out, understanding of the missions of Son and Spirit not only confirms the judgments about the world's being as divine epiphany made in the opening ontology but also shows the being of the world flowering under the sun of transfiguring grace. This makes appropriate the choice of title and epigraph, for which I am again indebted to the distinguished poet, my fellow-countryman, Geoffrey Hill. The completion of the present study seems a good time to thank too all those in T&T Clark's publishing house who have made the production of these books so singularly free of heartache. Writing them has sometimes been a labour, but it has been a labour of love on behalf of the faith of the Church which Cardinal Balthasar so signally served.